If you're looking for inspiration and insights on topics related to well-being, motivation, innovation or improved performance, we can help. Our keynotes and on-site presentations are lively and spirited, with lots of easy-to-use tips to get everyone "in motion" - and on the road to enhanced well-being. Her unique style of speaking combines relevant science with meaningful stories and a good dose of humor. "Laura gave a superb opening address at Workforce Strategy 2017. A dynamic and professional on-stage presence, Laura communicates by showing more than telling; her use of images, powerful data points, examples and stories enhances impact, as evidenced by numerous references to her content throughout the rest of the conference." *Not available to the public. ND Rural Electric Coop. Assoc. 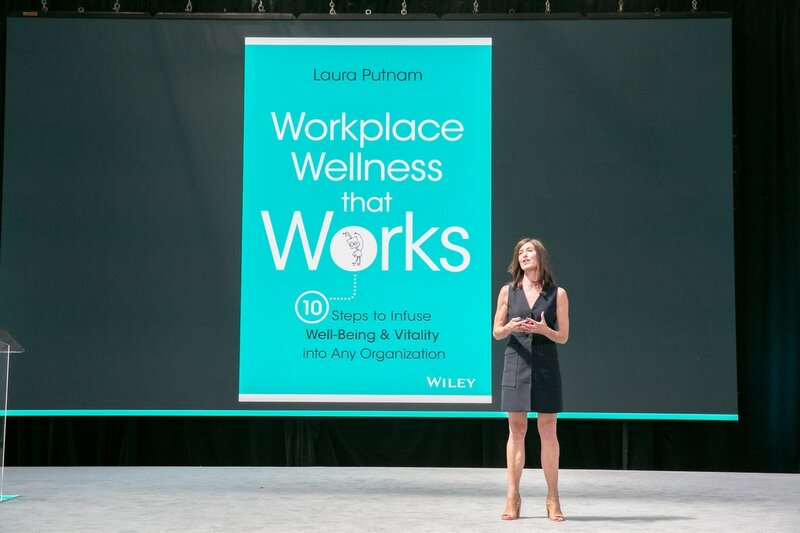 "Laura was an amazing speaker and her book is one of the best I’ve read on worksite wellness!" If there’s ever a time we need workplace wellness, it’s now. But do these efforts actually work? Evidence suggests that most do not. In this educational and entertaining session, learn how you can Start a Movement of well-being in your organization! Every manager has the opportunity to serve as either a "multiplier" or a "gatekeeper" of well-being for the employees they manage. This thought-provoking keynote will help managers to lead differently, which will in turn catalyze their team members to engage anew with their work and well-being. If your organization is like most, you’ve got a wellness program that’s underfunded and under-enrolled. Learn about a novel “stealth strategy” of sneaking wellness into non-wellness initiatives. Get more money, higher rates of engagement, and finally a wellness program that actually works. Well-being is foundational to being Me At My Best. Learn about simple ways you can infuse well-being into your daily routine, even when there’s “no time” so that you can be your best. By starting with yourself, you'll discover how you can stand up for being the change!